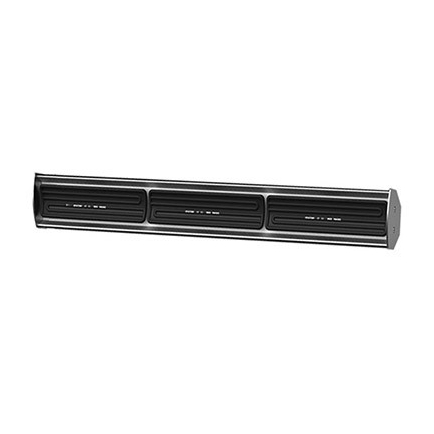 How are wall mounted outdoor heaters installed? 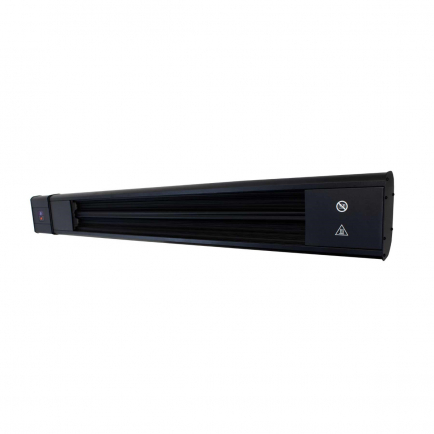 Wall mounted outdoor heaters are one of the few types of electric heating product that require the services of a professional electrician for installation. This is because they need to be hardwired into the mains of your building and it’s important that they adhere to safety regulations wherever they’re fitted. Though they’re not suitable for DIY installation, a professional will be able to install an outdoor heater quickly so most projects won’t require a lengthy call-out. A lot of infrared heaters are weatherproof, but to make sure you’ll need to check the product’s IP rating before you commit to purchase. IP or ‘ingress protection’ ratings indicate how protected an electrical appliance is against the ingress of solid objects and water. IP ratings are made up of the letters ‘IP’ followed by two digits, e.g. IP24. The first number indicates protection against solids and the second number indicates protection against water, so it’s likely you’ll be most concerned about the latter of these two digits when choosing an outdoor heater. Heaters that will be exposed to the elements need a protection rating of at least IPX4, which protects against splashes of water from all directions. Anything less than this will be inadequate for installation outside unless it’s in a fully sheltered area. If you think your heater will be in a location that’s particularly vulnerable to harsh weather conditions, it’s best to opt for an IPX5 rated product or higher to ensure it’s well protected against water. 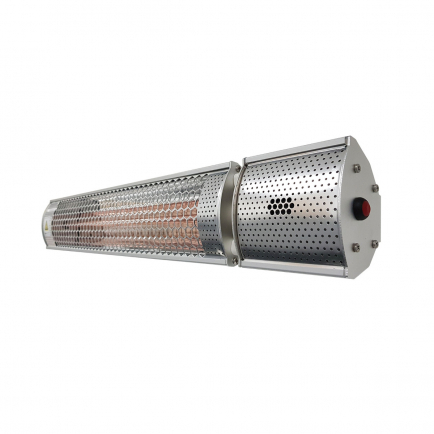 There’s a lot of information to take in about IP ratings, especially as there are no cut-and-dried rules surrounding outdoor heaters because each installation varies considerably. For more detailed information, take a look at our IP ratings guide or give our friendly sales team a call to discuss your heating requirements. How can I control my outdoor patio heater? Our outdoor patio heaters come with simple on/off controls but can be fitted with additional accessories for a greater range of heat management options. Push-button timers are popular for home and commercial applications as they limit the amount of time the appliance stays in operation to help reduce energy usage. This type of control is ideal for anyone who feels they may forget to turn off their heater when they’ve finished using it, or for those who will only need heat occasionally or for short periods of time. Timers vary in their minimum and maximum durations so always check their timer range before purchasing. Dimmer switches give users the freedom to adjust their heater’s output as desired rather than settling for the same level of heat offered from basic controls. Their level of sophistication can differ considerably: some come in the form of a simple turn dial, whereas some are Bluetooth enabled to allow users to control their heater from their phone or tablet. Dimmers make outdoor heaters more adaptable to the needs of the individual and can help to keep energy usage low by not having heaters on at maximum every time they’re switched on. The virtues of motion sensors have long been extolled within commercial and industrial settings and can present significant savings to businesses that adopt them across the board. Motion sensors are most commonly associated with lighting but what you may not know is that they also work excellently with heating systems. These controls are most useful where staff or customers regularly frequent certain areas during the day and need quick, responsive heating. You’ll never be wasting energy warming an empty space with this type of heating control so running costs are always kept as low as possible. Accessories for outdoor heaters should always have at least an IPX4 weatherproof rating but, as usual, it’s best to double check this information while you browse to avoid disappointment. What size area do patio heaters heat? Patio heaters come in all shapes and sizes to suit every project, no matter whether it’s for domestic applications or a large commercial space. We offer everything from basic wall mounted heaters that heat patio areas from 13m², all the way to high output heaters capable of warming a 44m² restaurant terrace or pub garden. All you need to do is measure the area of the outdoor space you want to keep warm and find a product with a ‘heats up to value’ that equals or exceeds this value. We always suggest choosing a product that exceeds the size of the space you need to heat as this will ensure it keeps the space adequately warm. Smaller heaters can struggle in more exposed areas where the effect of their heat can be offset by colder temperatures and wind-chill. 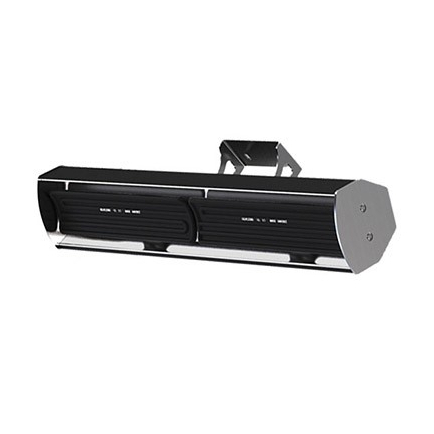 Can your outdoor heaters be ceiling mounted? 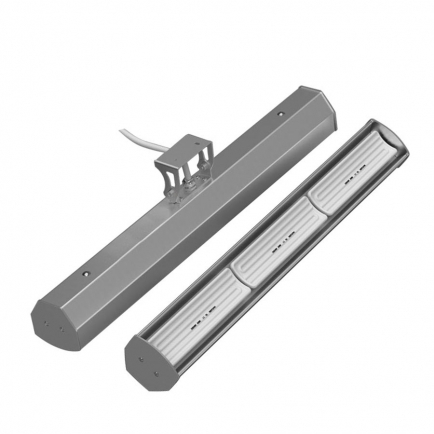 All of our Burda infrared heaters can be ceiling mounted, if desired, provided you use suitable brackets. The majority of our Herschel ceramic infrared heaters require a wall mounted fitting. Although we do offer some ceiling mounted solutions in this range, they are designed for large indoor areas such as warehouses and workshops. 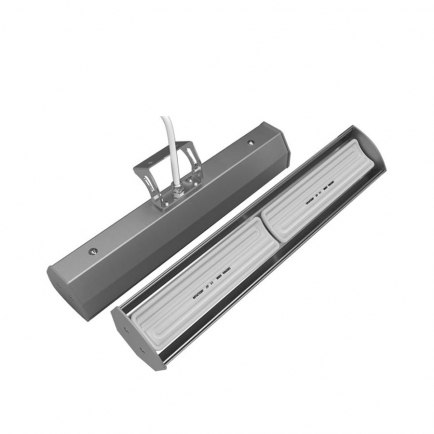 As such, these ceiling mounted ceramic heaters are not suitable for an outdoor environment. Wall mounted outdoor heaters are arguably less intrusive than freestanding outdoor heating methods, allowing you to enjoy warm evenings without compromising on your garden design. Wall mounting your outdoor heater also helps to keep it out of reach for additional protection from its surface temperature. 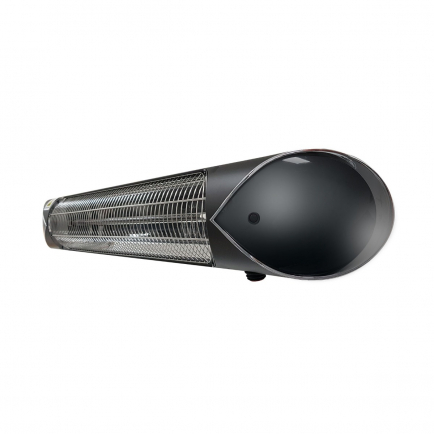 We have a wide range of outdoor heaters that are suitable for wall mounted installation, from smaller heaters suitable for gardens and patios, to large infrared heaters suitable for commercial applications and hard wearing, weatherproof models for use in areas exposed to harsh weather conditions.